WEDNESDAY, 07 SEPTEMBER – Chairman of the Board of Directors (BOD) UMS, Tun Dato’ Seri Zaki Tun Azmi urged new students of Universiti Malaysia Sabah, Labuan International Campus (UMSKAL) to master the English language in order to facilitate their understanding of teaching and learning (P&P) taught by their lecturers in the lecture room. He also wanted them to learn other international languages including Chinese, Japanese, Indian and Arabic. “If we can speak more languages, it is easier for us to interact with the international community as well as understanding the teaching and learning conducted in the classroom,” he said. 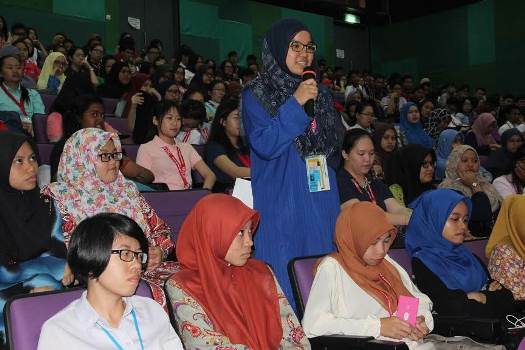 He was speaking to a crowd of about 600 new students in UMS Labuan at the Meeting with the BOD Chairman with UMS Labuan New Students for the 2016/2017 Session at the Main Lecture Hall, yesterday. Also present were the Vice-Chancellor of UMS, Professor Datuk Dr. Mohd Harun Abdullah; Deputy Vice-Chancellor (Student Affairs and Alumni), Associate Professor Dr. Ismail Ali; UMS Registrar; and UMSKAL Director, Associate Professor Dr. Murnizam Haji Halik. Tun Zaki also shared his experience as a Judge and gave his views on the economy of the country.